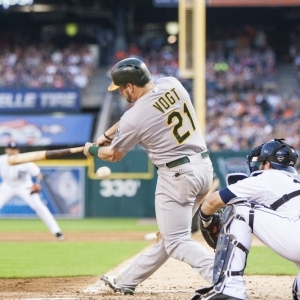 The Oakland Athletics host the Colorado Rockies at O.co Coliseum on Tuesday. The probable starters are Jorge De La Rosa for the Rockies and Sonny Gray for the Athletics. The opening line for this matchup has Colorado at +158 and Oakland at -168. The over/under was set at 7. The Rockies have a 41-33 over/under record and a 39-36 run line mark, meaning they cover 52% of the time. The Athletics are 38-40 against the run line and have a 44-28 over/under record. They cover the spread 49% of the time. The Rockies show up with a 33-42 record, including 16-20 on the road. Starting pitcher Jorge De La Rosa holds a 4-3 record with an earned run average of 5.15 and a WHIP of 1.53. The Rockies are 6-5 over his 57.2 innings pitched and he's also given up 57 hits over that time period. The Rockies are also 5-6 against the over/under in his starts. He is getting 4.8 runs from the team when he takes the mound. The bullpen has given up 259 hits on the season and have a earned run average of 4.72. Teams are hitting .264 against the bullpen while being struck out 213 times and walking 83 times this season. As a team, Colorado has allowed 9.81 hits per nine innings while striking out 6.77 batters per nine. They are 30th in the league in team earned run average at 4.94. As a team, Colorado is batting .270, good for 3rd in the league while putting together a .241 average away from home. The Rockies on-base percentage sits at .320, which puts them at 12th in the league and they have a team slugging percentage of .437. They rank 4th in baseball with 9.25 hits per game and DJ LeMahieu leads the team with 83. Oakland is 14-23 at home while holding a 34-44 overall record on the season. With an earned run average of 2.09, Sonny Gray will come into this game holding a 9-3 record and a 0.99 WHIP. The Athletics have a record of 9-7 over the 107.2 innings he's pitched during which he's given up 81 hits. The Athletics are also 10-3 against the over/under in his starts. He is getting 5.4 runs from the team when he takes the mound. The bullpen has given up 207 hits on the season and have a team earned run average of 4.46. Teams are hitting .248 against the Athletics bullpen while being struck out 205 times and walking 80 times this season. As a team, Oakland has allowed 8.22 hits per nine innings while striking out 7.63 batters per nine. They are 8th in the league in team earned run average at 3.54. As a team, they are batting .259, good for 10th in the league while putting together a .267 average at Safeco Field. The Athletics on-base percentage sits at .322, which puts them at 10th in the league and they have a team slugging percentage of .395. They rank 6th in baseball with 9.01 hits per game and Brett Lawrie leads the team with 77. In terms of team defense, the Rockies have a fielding percentage of .984 with 45 total errors, 842 assists and 1,974 put outs. For the home team, they hold a .974 team fielding percentage while committing 75 errors, accumulating 775 assists and compiling 2,073 put outs.